In the past, all kinds of documents such as licensing contracts and artist /agent agreements were signed by hand and sent through the mail. And when time was of essence they were signed and FAXed. However, there could be a potential problem in signing documents by this method because there is no way to tell if the documents were altered or the signature(s) forged unless the document was scrutinized by a forgery expert. Now with the proliferation of computers and use of the internet, documents are often sent back-and-forth via the internet resulting in even more possibilities of document and signature tampering. Using certified digital signatures on documents are a way to avoid these problems. What is a certified digital signature? A certified digital signature establishes that the signature is unique to the person signing it, can be verified, is under the control of the person using it, shows the signees consent in signing the document and it has not been altered after it was signed. Certified digital signatures can be verified by third party public key cryptography (PKC) companies that produce digital certificates or can be created by individuals with their own personal digital signature. PKC certificates has a greater degree of verifiability than one created by individuals that require additional steps to verify the signee. PKC certificates are similar to signatures being notarized. The companies that supply PKC certificates are authorized by a state certification authority to keep track of whom is assigned to a certificate, verify their validity, and track revoked and expired certificates. Note: In my opinion, going to the expense in using a PKC system to certify a digital signature is probably not needed for most contracts used in art licensing. 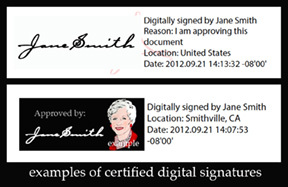 A certifiable digital signature created by an individual should be sufficient to verify that the signature is authentic. However, I am not an attorney and if you have any questions about digital signatures you should consult an attorney to get a legal opinion. There are many software packages that allow a person to use an electronic signature, a certified digital signature, or a PKC certificate. The most dominate software is Adobe Acrobat and Adobe Reader for .pdf formatted files. Note: The example at the top of this article was created with a font (not recommended) instead of a handwritten signature and applied to a .pdf file in Adobe Acrobat. A digital signature in Adobe Acrobat or Reader is more than just a signature. It also includes the date and time signed. It gives the options to include the reason why it was signed, the location, and business name. Also the digital signature does not have to be just a copy of a handwritten signature but could include a photo of the signer with the signature to give additional authenticity. A person can create their own personal certified digital signature in Acrobat and Reader* (version 8 and later). Note: A person cannot sign an Adobe Reader document with a digital signature unless the .pdf file Usage Rights has been enabled when saved with Adobe Acrobat. • The first step in creating a certified digital signature is to either scan a handwritten signature into the computer and save the file as a .pdf or write the signature with a digital pen in software such as Adobe Photoshop and save it as a .pdf file. • Second, a digital ID is created by entering the name, organization (if wished), email address, location on the computer where the ID is stored, and password. The password will be used each time a document is signed to give complete control to the person using the signature. • Third, configure how the signature appears on the document by opening the configure signature appearance window to select the graphic and information you wish to appear with the signature. Once a signed document is open in Acrobat or Reader the document is checked to make sure that it was not altered since it was signed. If it was, a message appears that states that the document has been altered. Clicking on a valid certified digital signature in the document results in the opening of a validation window stating the document has not been modified since the signature was applied, the document is signed by the current user, and the signing time is from the clock on the signer's computer. A tutorial on creating certified digital signatures in Adobe Acrobat and Reader can be found in "Adobe Acrobat / Reader Tip: How to Create a Certified Digital Signature". Note: Older versions of Reader before version 8 will not show certified digital signatures. To view them, download a FREE current version of Reader from adobe.com website. Applying an electronic/digital signature to contracts and documents and sending it via the internet is legal in the United States (since October 1, 2000) and other countries as long as their e-signature laws are followed. In the U.S. every state has at least one law concerning e-signatures but it is the federal law (ESIGN Act) that takes precedence over state laws. It provides that electronic signatures and records are just as good as their paper equivalents. And thus they are subject to the same legal scrutiny of authenticity that applies to paper documents. Showing that an electronic/digital signature is authentic is very important. Even if it is legitimate it could be tossed out-of-court if the judge thinks that the signature process does not provide the appropriate level of assurance. Therefore, the higher the assurance methods used in an electronic/digital signature the most likely it will be accepted. Adobe Reader and Adobe Acrobat provides those qualifications when a certified digital signature is used. Below are links to more information on the importance in proving the authenticity of electronic/digital signatures and electronic/digital signature law in various countries. • "This is legal, right?" • "Digital signatures and law"
Electronic signatures are legal in many countries but the greater the assurance that they are authentic the more probable they will be accepted. Therefore, it is advisable to either use a certified certificate provided by a licensed PKC company or a customized certified digital signatures created by the individual signing the documents as discussed in this article. It is also advisable to use the certified digital signatures on documents in software that provides the security and proof of authenticity that Adobe Acrobat and Reader gives. Electronic signatures on documents are legal in most countries including the US. And if the signature is certified and the document unchanged after it was signed, the more likely it will be trusted to be authentic. Adobe Acrobat and Reader are the predominate software that allows a person to sign a .pdf file with a certified digital signature. Read "Art Licensing: Using Certified Digital Signatures in Contracts" for more information on certified digital signatures, certified certificates, what requirements makes digital signatures legal, and why digital signatures created in Adobe Acrobat and Reader conform to legal requirements and gives assurance that the documents are authentic. There are three steps to create your own personal certified digital signature in Acrobat and Reader* (version 8 and later). 1. Either scan a handwritten signature into the computer or write the signature with a digital tablet/pen in graphic software. 2. Create a digital ID with a password. The password will be used each time a document is signed. 3. Configure how the signature appears on the document by opening the signature appearance window to select the graphic and information you wish to appear with the signature. Below are instructions on how to do these steps in version 10 of Acrobat and Reader. These instructions may be long and seem complicated but they are really easy. Once the signatures, digital ID and look of the signature (appearance) are created, certified digital signatures can then be applied to .pdf files with a click and drag of the mouse. * Adobe Reader .pdf file cannot be signed with a digital signature unless the Usage Rights were enabled when the .pdf file was saved by Adobe Acrobat. Read the enabling Usage Rights for Adobe Reader with Adobe Acrobat second at the bottom of this article. A signature can be handwritten, scanned as a .jpg file, and placed into graphic software such as Adobe Photoshop or it can be created with a digital tablet and stylus while in graphic software. The signature then needs to be saved as a .pdf file. Or the signature file can include a logo or a photo of the owner of the signature. The photo adds more authenticity to the signature. It can be created in Photoshop and saved as a .pdf file. The example at the top of this article shows this type of certified digital signature. Note: An actual photo of a person and signature should be used but for illustration purposes I used a drawing of a person and a font to type the signature. 1. Open a .pdf file in Acrobat and select "Tools" at right top of Acrobat panel to open the tool bar. 2. Select "Sign & Certify" and then "More Sign & Certify"
3. Select "Security Settings" in the pull down menu to open the "Digital IDs" window. See example A. 4. Click on "Add ID" at top of window to open the "Add Digital ID" window, click on "A new digital ID I want to create now". See example B. Then click on "Next >" button. 5. In the new window enter the name of the signee, organizational Unit (optional; example = artist), Organizational Name (optional; example = Fun Art), Email Address. Note: The key Algorithm (code that secures the data) default is 1024-bit RSA but Adobe literature states that 2048-bit RSA is more secure. See example C. Then click on "Next >". 6. In the new window enter the file location on your computer where you want the digital ID filed, and assign a password to protect the digital ID data. A password with a combination of numbers and lower/upper case letters give a better rating. The password will be required every time a document in Adobe Acrobat is signed with a digital signature. See example D.
7. Click on "Finish" to go back to the Security Settings window. The digital ID is now listed in the window. Click on "close". Note: More than one digital ID can be created for different uses or persons. Open a .pdf file in Reader and choose Edit > Protection > Security Settings to open the "Digital IDs" window. 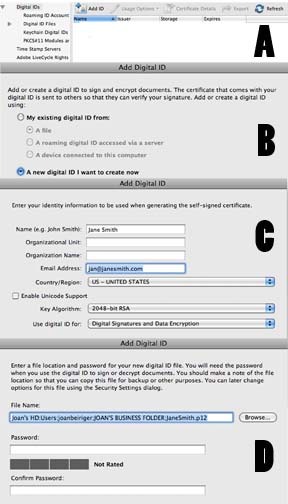 Then follow the same steps used in Acrobat (#4 - 7) for creating a digital ID. 1. Open a .pdf file in either Acrobat or Reader. Select "Preferences" under the word Acrobat (Command + Comma) to open the preferences window. 2. In the Preference window select "Security" to open the "Digital Signatures" window. 3. Check the box for "Verify signatures when the document is opened" and for "View documents in preview document mode when signing". See Example E.
4. Select the "Advanced Preferences" in the upper right of the window. In the "Digital Signatures Advanced Preferences" window select "Creation." 5. Check "Include signature's revocation status when signing", "Show reasons when signing", and "Show location and contact information when signing." See example F. Then press "OK" to go back to the Preferences window. 6. On the right side of the "Appearance" box press the "New..." button to open the "Configure Signature Appearance" window. 7. Name the appearance in the "Title" box. 8. Click on "Imported graphic" button in the "Configure Graphic" section and import the .pdf Graphic of the signature from your computer. 9. Click on the text items in the "Configure Text" section that you wish to appear in the digital signature. See example G. Click on OK to go back to the "Preferences" window. You can create multiple appearances that can be used for different purposes. Do steps 6 through 9 (above) to create another appearance. You have the option to choose which appearance you wish to use when signing a document. 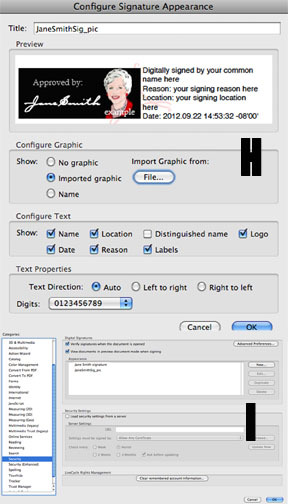 See example H. Example I shows the two newly created signature Appearance names. A digital ID can be created in Adobe Reader but as mentioned above a person cannot apply a digital signature to the document in Reader UNLESS the .pdf file Usage Rights was saved by Adobe Acrobat. A person can tell if the usage rights was saved if the Extended pull down menu is listed at the top right of the Reader window (next to Comment). To learn how to enable Usage Rights for Reader, see the section below "Enabling Usage Rights for Adobe Reader with Adobe Acrobat". 1. open Tools > Sign & Certify. 2. Click on the Sign Document. Then click and drag a rectangle box on the area in the document that you want the digital signature to appear. If a message appears that says "This document contains rich content that . . . " click on Continue. A grayed out area appears on the document. 3. Click on "Sign Document" at the top of the window. After a pause the "Sign Document" window appears. 4. Select a "Digital ID" in the "Sign As" space, enter the password for the Digital ID, select the appearance you want, and enter any additional signature information. Press Sign and a "Save As" dialog box appears. Change the name and press "Save" OR simply press "Save" to save the file with the Digital Signature. If another signature is needed and the person only has Adobe Reader the file should also be saved with Usage Rights. See the section below on "Enabling Usage Rights for Adobe Reader with Adobe Acobat". To sign the document in Adobe Reader with a digital signature, the file must have the word Extended (next to Comment) at the top of the window. If Extended is missing, the file does not have Usage Rights and a digital signature cannot be applied to the document. 1. Click on Extended to open the menu and then click on Sign Document. 2. Follow the on-screen instructions to create and place the signature on the document. 3. Then follow step 4 for signing documents in Acrobat. When the file was saved after signing the document, the Usage Rights were also saved and Extended is still enabled. Thus, additional persons can sign the document in Reader. Caution: If you save the file by selecting File > Save As > PDF the Usage Rights will be lost and no more signatures will be allowed. In Adobe Acrobat the Usage Rights can be enabled by selecting File > Save As > Reader Extended PDF > Enable Additional Features. When the file is opened in Reader the Extended pull down menu is enabled and a digital signature can be applied to the document. To apply a certified digital signature to a .pdf file a person must first create a digital signature, then a Digital ID, and finally an appearance on what information is included in the digital signature. The originator of the document or the first person that applies a digital signature must own Adobe Acrobat. That person must save the file with Usage Rights enabled if other persons that need to sign the document only have Adobe Reader. If an artist does not create paintings digitally it is still useful for her/him to understand how the brush dynamics change the look and use of the different brush tip shapes in Photoshop. Brushes are very useful for adding signatures to paintings, creating textures, creating wash backgrounds, and touching up scanned images. 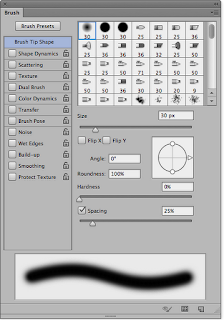 The eraser tool also uses the brush tip shapes for different erased effects. Hint: Read "Photoshop Tip: How to create customized signature brush." Custom brushes can be created by altering the settings (shape, scattering, texture, color, noise, etc.) of an existing brush tip shape or creating one from scratch to get the desired effect. Below are links to a comprehensive series of excellent Photoshop video tutorials by Robin Wood describing and showing the different brush dynamics. These videos were created with an older version of Photoshop and the brush panel is somewhat different and some of the dynamics are in different places on the brush panel if you are using CS5 or CS6. However, they operate the same so viewing these videos are worthwhile to learn about the different dynamics and how to alter them for different brush tip effects. • "Brushes 1 - Photoshop Tutorial"
• "Brushes 2- Shape Dynamics"
• "Brushes 3 - Scattering - Photoshop Tutorial"
• "Brushes 4 - Textures - Photoshop Tutorial"
• "Brushes 5 - Dual Brush - Photoshop Tutorial"
• "Brushes 6 - Color Dynamics - Photoshop Tutorial"
• "Brushes 7 - Other Dynamics - Photoshop Tutorial"
• "Brushes 8 - Below the Line - Photoshop Tutorial"
• "Brushes 9 - Making Your Own"
Some of the above videos use a pressure sensitive tablet with a stylus such as a Waccom tablet. You do not need to use a tablet to use many of the brushes. But Photoshops new brushes that were introduced in CS5 can create some amazing results when used with a tablet and a special stylus. The brushes can be rotated and held at an angle to apply "paint" digitally just like actual paintbrushes can apply paint to a canvas. To see a demonstration of these brush tip shapes and bristle quality options view "Photoshop overview: Brush tip shapes and bristle qualities | lynda.com"